Let’s rewind to our childhood. As kids, we would play with our toys all the time. With Barbie, we would play dress ups and play shops. We would talk to her and change our voices to make it as if Barbie was actually talking back to us. Now with the new phenomenon of the Internet of Things, she actually can! This new Barbie doll names ‘Hello Barbie’ that incorporates hearing sensors to be able to make sense of the verbal cues within the environment. From there, it will be able to aggregate data about the agent–being the young girl or boy using the Barbie. This aggregation of data allows for the Barbie doll to remember different aspects about the lives of its agent and store it in a cloud. From there the Barbie gathers data from the internet in order to respond appropriately. This responding mechanism is a characteristic of the Internet of Things where devices that aren’t naturally connected to the internet are able to carry out actions of actuation. This means that they can make informed choices based on the information they have stored and the information they can retrieve from the internet. “Hello Barbie doll listens and remembers the user’s likes and dislikes, giving everyone their own unique experience,” says Mattel. Move aside Barbie, there’s a new cool girl and power couple in town. 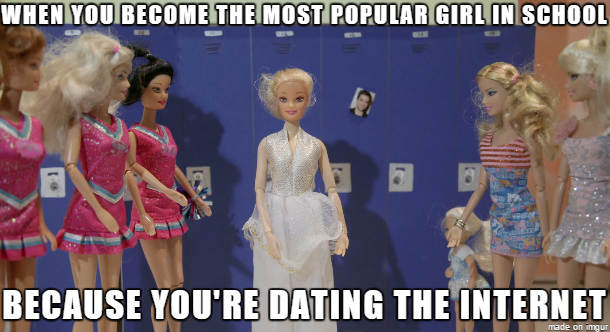 Barbie 2.0 and the internet are the hottest couple in school. But with the increase of human to machine and machine to machine interaction and two way dialogue, what will this mean for human to human interaction in the years to come? Will human interaction begin to dwindle as we replace real friends with AI friends with fake emotion and empathy? Also, there is the threat of privacy and the identity curation of children. With Hello Barbie’s ability to store recordings of the child’s voice and the child’s interests, how will the data be protected? Can you spot the sock puppet? We would all like to think that each thought is uniquely our own, but in the case of the 2013 Australian elections, our thoughts were being influenced… and we didn’t even know it. So 2013 was the infamous year that Tony Abbot and Kevin Rudd went head to head to become the Prime Minister. Whilst there was a lot of debate in parliament, there was also debate on Twitter. But whats the difference? Whilst we watched the debate on TV, we saw real people giving their real opinion with real support. On Twitter, we also saw people, giving their opinion and support. Except, these weren’t real people, these were sock puppets. These sock puppets–backed with a false identity– would use the online platform to influence the voters and sway them in a particular direction to support a specific candidate. They would tweet, retweet and mention key political figures where their tweets would be disguised by other human tweets making it easier for consumers to believe the information. In turn, the sock puppets created discussion around the candidates by popularising hashtags and spreading propaganda whilst too deceiving our thoughts. After media speculation, it was found that both candidates combined had 28000 followers who were botnets or cyborgs in the form of either sock puppets of meat puppets. What does this tell us about the governments that are in place today? They not only govern the masses but govern the cyber-masses by enforcing surveillance whilst too manipulating us into thinking a certain way… and we don’t even notice that it is happening. In today’s age, it seems as though we are always fighting a battle, on all fronts. We have physical warfare with bombs, guns and fighting with everything that we see on the news that is happening in Syria. Then we have a different kind of warfare that is happening right beneath us. Ok, not underground, but it may as well be. This battle takes place in the cyber world with hacktivists. In 2011, Sony was the target of Hacktivist group; Anonymous after the company filed legal action against George Hotz. Legal action was filed against Holtz because he released an encryption key and software tools onto his website which allowed PlayStation users to completely control their console. Holz simply used the information he had and shared it with the world with the intention to make PlayStation an open source allowing users to alter the console individually–much like the open source operating system of Android. In these attacks, Anonymous dropped a ‘Low Orbit Ion Cannon’ software to flood Sony’s internet traffic and force them to go offline. Once they were offline, 77 million users’ names, user names, addresses, email addresses, birth dates, and passwords were stolen. While they are activists for the people and stand up for our right to use information and technology how it is suppose to be used, and how it should be used–to its fullest and open potential. It also impacted the lives of gamers by shutting down the site and stealing the information of users. If they stole the information themselves, or if taking down the site allowed for another party to come in and steal the data, we don’t know. But there will always be a positive and negative impact on the world at the hands of activism, the same goes with was on the battlefield. If the Hunger Games was real life we would all have our phones out and ready to record the brutality that goes down in the games. We would record rues death and Katniss’ reaction and someone would have uploaded it to YouTube or Facebook to show the world. Before we know it we would all be raising our hands in protest. That’s how a revolution starts! But what if I told you that we are already living The Huger Games! What does your tweet mean anyway? Everyone is entitled to an opinion, but it wasn’t until Twitter came along and provided us with a platform to express our views on. So in a world where everyone can create content and participate in online conversation, the value comes from sorting information. This is where we, as users become the gate watchers. When trending topics appear on twitter, they are only live for a certain amount of time, meaning that we only have a small window to participate. This is because the speed of access becomes valuable. In this time we respond to the production of an idea or event and then we voice our opinions on Twitter, where an aggregation of thoughts begin to emerge. But it is the users as the gate watchers who curate the tweets by liking, responding, re-tweeting and by bumping the topic into Twitters line of vision to then declare it as a trending topic. Without a hashtag attached to the tweet and the curation of tweets on the trending topics link, the tweets would make no sense. This is because an individual tweet is worthless without a curation of aggregated tweets that provide its value and meaning. It provides context. Lets look at this weeks trending topic: #InternetTVshows which was created by the comedy show midnight. People were tweeting what they thought were good remixes of TV shows and the internet. It wasn’t long until Trump made an appearance! But all of this wouldn’t make any sense on each persons individual news feed. It would look like someone took to twitter after a few drinks. But the sum total of everyone’s tweets that were curated by gate watchers created a bridge of pebbles. But the trick here is to be fast because in the blink of an eye a new topic is trending and this topic is old news. Here we are once again debating the war between IOS and Android. But with the introduction of the new iPhone 7 yesterday, the war just got a little bit more entertaining. Long gone are the days of the headphone jack, Apple has introduced AirPods as a new wireless way to listen to music. But why is this so controversial? Imagine the internet as a huge manor where we as the users of this manor cannot change, or sell the land for it is the Feudal Lords that decide how the land is used. We are able to just simply use the Manor, grow crops on its land, upkeep the state of the property. It sounds like a lot of work right, but what if I told you that you chose to work for free within this manor, everyday! Social media sites such as Instagram, Facebook and Pinterest are the manors that we live in daily, however, they have the power to decide how we use the sites, what content we upload and how much access we are granted to the whole site.